Toshiba’s latest tablet, the 7” Encore Mini, offers a Windows 8.1 mobile experience for the surprisingly low price tag of just $119. As you might expect, this isn’t a top-of-the-line product. The device is powered by a quad-core Intel Atom chip and 1GB of RAM, with 16GB of storage. The screen offers just 1024 x 600 resolution and the camera only goes up to 2 megapixels (0.3 rear). It’s not a good tablet setup for gaming, but it should be just fine for light casual use. This tablet is pretty competitive with the $99 HP 7 Plus tablet on the budget end of the market. The big differentiator between the two are the operating systems – chances are, more people will feel comfortable with the familiar (though antiquated) Android 4.2.2 OS than the clunkier Windows 8.1 mobile experience. 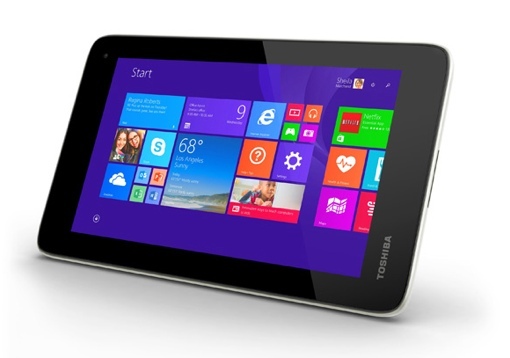 You can learn more about Toshiba’s 7” Encore Mini or pre-order yours at the company’s website. The device is expected to ship September 17.